Oyaide Electric, with experience gained from a long history of cable design, has developed a reference standard power cable called the Tunami. 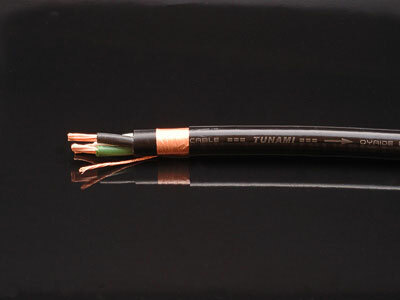 The Tunami is constructed using PCOCC-A wire developed by Furukawa Electric using advanced heat control and extrusion technology. The Tunami utilizes a 5.5 sq. mm conductor core that is rated up to 30 amps and can take up to 600 volts A/C. This makes the Tunami a leader in its class delivering a powerful sound. In addition it has a unique 3 layer shielding system not only to shut out external noise but also to suppress internal noise resulting in a very low noise floor. The combination of advanced and creative technologies delivers the recording artists' every intention along with the delicate atmosphere that surrounds them. This is an ultra pure single crystal copper originally developed by Professor Ohno. It was then further evolved into PCOCC utilizing a single copper grain wire. This design results in an extremely low level of signal disturbance and loss due to the lack of crystalline borders along the signal path. Oyaide has further refined this process with a highly controlled heating and cooling process and improved furnace management to realize a mirror finish. It is now called PCOCC-A and is the epitome of Japanese craftsmanship. It is a fundamental requirement of cable design that they be free from external noise. Oyaide has been a leader in this area with a traditional star-quad structure. Oyaide has gone a step further with the Tunami employing a unique three layer shielding system. The first layer absorbs the disorders of electromagnetic field formation; the second (carbon) layer is used to absorb the random movement of electrons caused by current fluctuations stored in insulating materials and a third copper foil layer with a drain wire to protect from external noise sources. The drain wire is then connected to ground for perfect shielding. The philosophy at Oyaide is to try every possiblity until they have achieved the optimum harmony among the various materials employed in a design. They tested multiple variations in hardness and density of insulating materials to deterimine which combinations would yield the greatest resonance control. The result was to employ several grades of high polymer polyolefin in the internal structure for maximum benefit. They then developed a method for applying the coverings onto the conductors with greater tension to achieve a more uniform and secure fitting.